Posted on 28 April, 2017 at 10:47 am. At Become, we believe there is a world of potential in every young person. However, our years working with children in care and young care leavers has shown us that pre-care experiences, and time in care, can leave young people lacking in self-belief and aspiration. Disrupted childhoods, traumatic experiences and a constantly shifting stream of professionals intervening in their lives can also lead to real difficulties in developing trusting and healthy relationships, both as children and into adulthood. 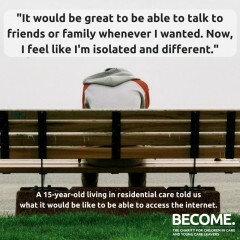 These experiences can all contribute to care leavers being vulnerable to loneliness. Last year, we made the decision to change how we work with young people in care and young care leavers. This shift has seen us move away from focussing on the development of life skills needed for independent living, such as workshops around budgeting or cookery, towards something more fundamental. Partly, this was because we recognised that what young people were valuing most about their time spent with the charity were the relationships they were able to form – with other care-experienced young people, and with our staff. With that in mind, we worked with experts in positive psychology and together we have created a bespoke coaching programme for care-experienced young people aged 16 to 25. The Become Coaching Programme is a groundbreaking service that aims to achieve profound, positive and sustainable improvement in young people’s wellbeing. Participants receive fortnightly one-to-one, and regular group coaching sessions, with their involvement lasting for up to a year. Young people develop a supportive relationship with their coach over time, and can also meet other young people, with whom they can learn, share experiences and, we hope, form friendships. Coaching gives young people the power to unlock their own potential for positive change. It empowers young people to think about their future and move forward positively in their lives, by creating and working towards specific goals. Through this process, young people are provided with the tools they need to build resilience, improve wellbeing and understand themselves better. A key component of the programme is about helping young people learn how to form strong, healthy relationships into their adult lives. We know that when care-experienced young people get the right support, they can unleash their potential and thrive. That’s why we’ve launched the Become Coaching Programme – to give young people the tools to face their future positively and with the resilience to overcome challenges, including loneliness, along the way. You can find out more about the Become Coaching Programme here. Become’s free Care Advice Line, for young people in care, care leavers or those supporting them, is open Monday to Friday, 10:30am – 3pm on 0800 023 2033 or at advice@becomecharity.org.uk. Rufus, our Advice and Information Manager, can provide information, advice and signposting on all sort of things to do with being in or leaving care, such as education, wellbeing, accommodation or benefits.